Good morning! I snapped this photo yesterday when I had about 14 rows left to do (I think) now I only have five rows. Hopefully I will have this shawl finished by the end of the day. I'd love to have this finished by dinner time so I can do a quick soak in wool wash and block it out before I go to bed. No pressure right? I have daydreams of wrapping this up and giving it to my daughter at her bridal shower over the weekend. She knows all about the shawl but still, it will be exciting to have one more gift to open! My reading has been fast and furious. I finished Milk Glass Moon by Trigiani and enjoyed the novel. I'm taking a break from the series once again and started O Pioneers by Willa Cather. I haven't read her ever and I'm really really enjoying her writing style. That book is on my kindle and isn't photoed. However, once I finish Cather's book, I'm starting Silver Linings Playbook by Matthew Quick. My son and I will read it at the same time and discuss. I love the movie and can't wait to dig into the book because chances are the book will be so much better than the movie. I read O Pioneers earlier in the year - loved it! Your daughter will be so thrilled! 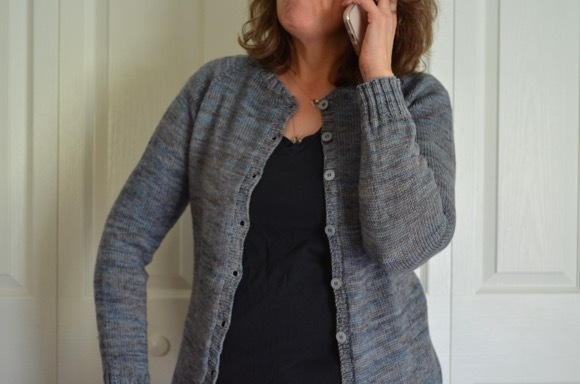 All the photos of your shawl have made it look so soft and gorgeous - wish I could feel it! I cannot wait to see it all blocked and beautiful. I read Cather's book, The Song of the Lark, and really, really enjoyed it. I'd like to read more of hers! I'm so impressed that you're actually going to have the shawl finished! How special that will be for your daughter! Blocking lace is always magical. I can't wait to see it! you finished with time to spare!!!! YES!!!! I'm sure she will be thrilled...with the shawl, of course, but more for the love that went in to its creation! Lovely!!! That shawl will be so lovely. I love Cather. Enjoy. Karen, the shawl is stunning!! I can't wait to see it finished! Your daughter is sooo lucky...what a gorgeous shawl and a wonderful mom she has!!! Such a delight, simply stunning, made with love. I enjoyed the movie. Let us know about the book. The shawl is gorgeous. I knew you would fly right through it. Show us pictures when it is blocked. What a great bridal gift! WOW, you are such a dedicated knitter! In the time I reknit the same five rows over and over, you knit a whole lace shawl! Haha! I can't wait to see it done, I have loved seeing the Instagram pictures of your progress! I loved that movie as well, and my husband especially loved it... I may be looking for that book for a gift! That is going to be a lovely shawl! So wonderful to give it to your daughter. :) I have not heard of any of the books you mention..I must take a look! I love this shawl, in case I haven't told you already! :) I'm sure your daughter will be happy to have. I knew you would get that shawl done in plenty of time. Please take photos of her opening it. I can't wait to see the look on your daughter's face when she sees how beautiful it is! And of course, I can't wait to see pictures of her wearing it. The big day is getting close!!! The shawl looks so delicate! I'm sure your daughter will love it and it'll be so nice for her to wear at the wedding. Hopefully we'll get to see pictures? Oh how beautiful and delicate...it's almost like a cobweb. Your daughter will look so lovely in it. It's really the perfect heirloom piece. I'm making a little lace knit bag for Hannah.Just a tiny messenger bag. 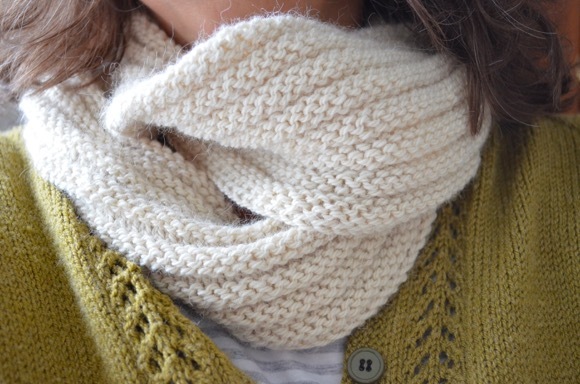 It's amazing how much more enjoyable knitting is when it's for someone special. Now that I've started making it, I don't want to put it down. I hope you finish today...I can't wait to see the finished shawl. Oh, your daughter is going to be so happy with that knitting treasure. What a wonderful gift! I am interested in reading Silver Lining Playbook as well after seeing the movie. Can't wait to hear what you think. So lovely, lacy and airy. Lucky daughter. And lucky me, a new book to add to my list! BACK TO knitting charity mittens and loving it. Bought some acrylic on sale at my LYS for the next pairs. I m reading Foal Play a story set in the outer banks that Channon sent me. I have DEEP DARK DOWN prepped for my beach read next week!! What a gorgeous shawl! so delicate. I'm sure it will be treasured. Oh Karen, the shawl is just gorgeous. What a special gift. The shawl looks dreamy. I hope you can get it done tonight too. Wishing you luck! I hope as I am typing this that your shawl I soaking or else already pinned and drying. Your daughter is going to be so beautiful Karen and I am thrilled just thinking of her special day. Beautiful shawl, Willa Cather's is a favorite of mine. Thanks for sharing. I loved the Silver Linings movie and may need to pick that book up. The shawl is gorgeous and O Pioneers is a favorite. 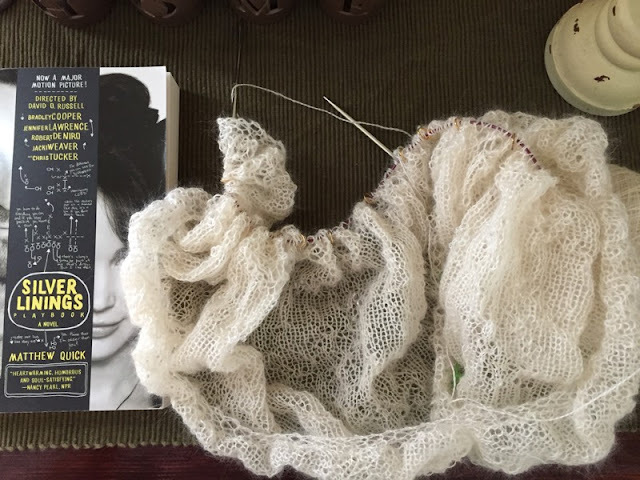 Happy knitting and reading!